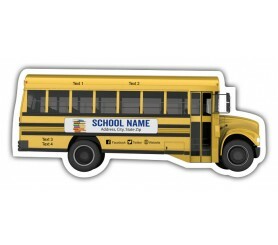 4.88x2.12 Customized School Bus Shaped Magnets - Outdoor & Car Magnets 30 Mil offer a great way to advertise your school brand, promotional events or any other special requirement. Want to raise money for starting your school bus service? These customizable magnets can do that too. Imprint all crucial information into these magnets and distribute it with great confidence. Place your order for these custom school magnets right now and achieve our free digital design assistance, free digital proofs, free full-color printing and free shipping offers. Request a quote to know what you can save on ordering these 4.88x2.12 Customized School Bus Shaped Magnets - Outdoor & Car Magnets 30 Mil in bulk.